At Troop 287, we take great pride in knowing that we well prepare our boys for the joys and challenges of life by teaching and testing them on their Scout knowledge and skills. Part of that process is to guide them through their advancements in the BSA Scout Handbook* and verify retention and internalization of what they’ve learned. When a Scout completes his rank advancements, we test him on his knowledge and skills at his Scoutmaster Conference. It’s the Scout’s responsibility to study and prepare for his Scoutmaster Conference ahead of time in order to demonstrate he adequately learned what was required of him for rank advancement. To help Scouts review and study for their Scoutmaster Conferences, we’ve created flash cards for each rank (Scout, Tenderfoot, Second Class, First Class) on their trail to First Class Scout. *The BSA Scout Handbook is copyright protected by the Boy Scouts of America. These flash cards are not published by the BSA nor do they have any copyrighted logo on them. The flash cards can be downloaded, reproduced, and used at no cost. They are NOT intended to be substitutes for the BSA Scout Handbook or any other BSA literature. Last updated: February 11, 2015 for BSA Scout Handbook, 12th Edition, ©2009 . The flash cards are protected under Creative Commons license. Anyone can download, print, and use for Scouting purposes free of charge. You are not allowed to sell or re-license the cards. MOBILE: The cards are small and easy to carry. The Scout can study just about anywhere … in the car, on the hiking trail, at home, etc. CONDENSED: The BSA Scout Handbook has a LOT of information and much of it is written in a narrative format. This can make it hard for Scouts to sift and retain the information. With the Flash Cards, the information is truncated to the core information we expect the Scouts to know. The information is formatted with short, numeric bulleted information to make it easier to memorize. CONSISTENCY: When we conduct a Scoutmaster Conference for a Scout, the Scoutmaster and Assistant Scoutmasters use the same Flash Cards to better ensure we are all asking the same questions. It can be frustrating for Scouts to get different questions from different adult leaders expecting different answers. EXPECTATION: The Flash Cards set a minimum expectation of what the Scouts need to know. They shouldn’t have any question what’s going to be expected of them. They either know the answers or they don’t. ANYONE CAN HELP: The questions are on one side of the cards and the answers are on the other. This allows the Scout to quiz himself. But other people, even non-Scouters can also quiz the Scout. They simply ask the question on one side of the card and they can see the answer on the other side. To reiterate, the Flash Cards do NOT replace the need for the Scouts to be in and reading their Scout Handbooks. That book should be well worn by the time they attain the rank of Eagle Scout. You’ll notice that the cards include page numbers that reference that information in the BSA Scout Handbook. Likewise, the Flash Cards are not intended to replace the Scoutmaster or Assistant Scoutmaster. They are simply a tool to help everyone learn their Scout knowledge and skills better. Also, be careful to not rely on the flash cards too much. The Scouts still need older Scouts and adult leaders teaching them what they need to know using the EDGE method. There’s no substitution for a real person teaching you how to do it! Also, the BSA Scout Handbook has a lot of other great information that isn’t necessary to know for rank advancement, but is simply just good to know stuff. Encourage your Scouts to read their handbooks profusely. Maybe 2-3 hours, good craftsmanship, patience, and a good attitude! Download and print the cards (print on just one side of the paper. Do not do double-sided printing. It won’t work). CUT ONLY on the DASHED LINES with scissors or paper cutter. FOLD on the SOLID LINES to form a single card, front and back. Repeat 2 and 3 until all cards are done. If using full-sized lamination sheets, place four cards on one sheet with stick side up. Spread the cards vertically so that they are at least 1/2 inch apart. Place 2nd sheet on top, sticky side down. If using clear packing tape (not as fancy, but a less expensive option), place two overlapping strips of tape on card and allow 1/2 of tape all around the card. Then place another two overlapping strips of tape on the other side. You’ll eventually trim the excess tape. Firmly press and squeeze out as much air and get a tight seal. Trim excess lamination with scissors to within 1/4″ of the card. Do NOT trim too close to the card or it will cause peeling. The lamination is intended to protect the cards from tearing and getting wet. While trimming, round the corners to help prevent peeling and remove sharp, pointy corners. On the ‘question’ side of each card, punch a hole about 1/2″ from the lower left corner using a hole puncher. Don’t put the hole too close to the edge to prevent tearing. Once all of the cards are finished, arrange the cards by rank (the cards are identified by rank and color coded). Place a key ring (1 1/2″ binder ring is a good size) or carabiner or zip ties through the card holes. If using zip ties, use two or three and don’t cinch too tight or you won’t be able to open the cards. Put your name on them somewhere with a permanent marker. Include your phone number and Scout Troop number. Take your time and be neat. The better you construct the cards, the better they will work and the longer they will last. You could very well use these for your entire Scouting career. NOTE: the PDF includes a sheet of blank rank cards so you can write or print your own questions, if you’d like. This allows you to add or replace questions as you see fit. Likely, your cards will look nicer and last longer. You could go with 1 inch diameter ring, too, but the cards don’t open or lay down quite as well. Q: What if my Scout has an earlier version of the BSA Scout Handbook? A: Sorry, this is the only version of flash cards we’ve made. And yes, some of the answers to the same or similar questions are different (e.g., how to remove a fish hook from your finger). We tell our older scouts that for their Scoutmaster Conferences, they can recite the knowledge they’ve learned in their books or what’s on the flash cards. Both answers are acceptable. Q: The cards don’t show how to actually do some of the skills such as how to tie the knots or lashings. Why not? A: Maybe in a later version we’ll add demonstration illustrations. For now, there are page numbers on the cards that reference the information in the BSA Scout Handbook. Q: How many cards are there? Q: Why isn’t there a card for every scout rank requirement in the handbook? A: We did the best we could. But, in some cases, to have a flash card for every requirement didn’t quite make sense. For example, it doesn’t make sense to have a flash card for ‘bring a friend to a troop meeting or outing.’ However, in the print out, there are blank cards for each rank so if you need to, you can write or type your own questions and answers and add them to your deck of flash cards. Q: Why not questions for Star, Life, and Eagle rank? A: Maybe later we’ll add something for those ranks. Please send us comments on our contact page if you have any ideas or recommendations. 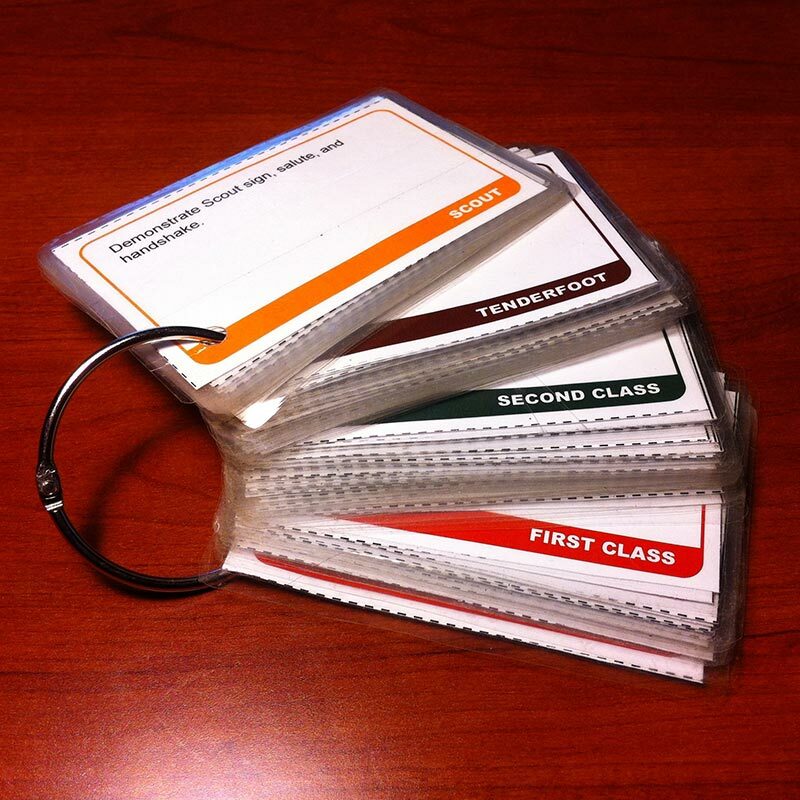 But for now, these cards cover the core information Scouts need to know for their trail to First Class. Of course, we expect boys to continue to know this information through their advanced ranks. By the time they’re an Eagle, they should know the information on the flash cards EXTREMELY well. Q: Are the flash cards required? A: Absolutely not. The BSA Scout Handbook is the official document for Scout rank advancement. These are simply recommended study tools to help Scouts prepare for Scoutmaster Conferences. It is purely the Scout’s option to make and/or use the flash cards. Q: My Scout is still pretty young and new to Scouts. Should I help him make his cards? A: That’s up to you, but we recommend the Scouts make their own cards. They may not be pretty, but its theirs with their own sense of character and pride put into them. They likely take several hours to make. That will give them incentive to take care of them and not lose them. Q: How were these cards created? Is it possible to edit them? A: These cards were created using a professional graphic design software called Adobe Illustrator. It is possible to edit them with any software that lets you edit PDF files. Q: Are these flash cards copyrighted? I’m not in Troop 287 in Colorado Springs – is it OK for my troop to use them? Does it cost anything? A: The flash cards are protected under Creative Commons license. Anyone can download, print, and use for Scouting purposes free of charge. You are not allowed to sell or re-license the cards. At this time, as far as we know, these cards do not compete with or violate the copyright of any existing BSA literature or product that we know of. However, if in the future BSA does create such a product, we recommend you immediately discontinue the distribution and use of these flash cards and purchase the the official BSA product instead. These cards did take some time to design and edit. If you find them helpful, a donation of $10, 25, or 50 is appreciated. 100% of your donation goes to Troop 287, Colorado Springs, CO. Happy Scouting!